This is a comprehensive list of all roses available for sale in the rose nursery as of DECEMBER 2018. 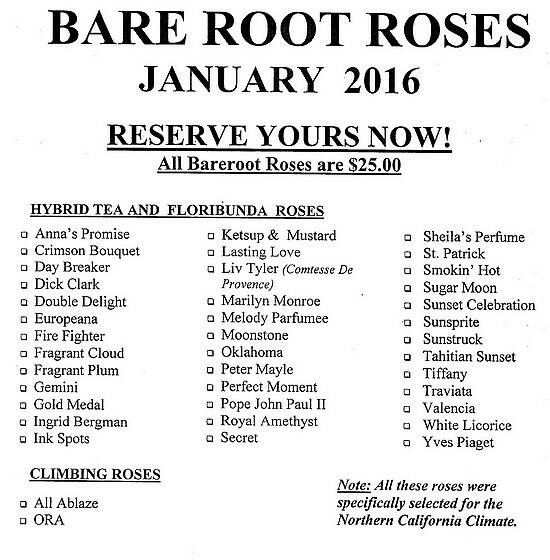 ALSO is a table at the bottom of bare root roses available to 2016, arriving in January. Please contact us if you have any specific questions, and we'll be happy to help! Please remember that we do not ship. Garden Sun * LCL 2002 7-8 ft. ab *** ? Leslie's Little Lavendar * MN <1998 24-30 in. m ** ? Lyda Rose * S 1994 3-4 ft. pb ** ? The Alexandra Rose * CL 1992 6-7 ft. yb ** ?